Unfortunately, the Easy Seam machine is currently unavailable. Read on if you would like to learn about this technology. If you were to try and dream up the best artificial grass seaming technology in the world, what would you ask for? It would have to operate with no messy glues. It would bond pieces very fast, maybe even in seconds.You should be able to stand on the turf within a few hours after installation. You would be able to use it by yourself to seam a whole turf project with no help. Maybe it would even fit in your hand and work at the push of a button. Sound good? We have a new seam system that does all those things.The Easy Seam machine has the best artificial grass seaming technology you can get right now. You can buy the Easy Seam machine from us, or rent it to try it out. You will be happy to havediscovered this new seaming technique the next time you lay out a lawn replacement.At Watersavers Turf, we offer a full range of turf accessories plus all the tools you need to install faux grass, and this is one of the items we are very excited to carry. Whether you know how to seam artificial turf or are about to bind a lawn for the first time, Easy Seam is about to be your best friend in the yard! Thanks to this cutting-edge technology, you can bind the fake grass for an entire yard all by yourself in one day. Here’s a quick guide for how to seam artificial turf with this new tape system. To use it, lay a strip of the Easy Seam tapeface-up under two strips of faux lawn. The turf should meet right in the middle of the tape. There’s even a bright orange line right on the tape, so you can see at a glance where to place the turf pieces for an even join. Once your faux lawn strips are in place on the EasySeam tape, it’s time to grab your EasySeam machine. This small hand-held tool has a heat cycle that melts the adhesive on the tape using a radio frequency field. When the tape heats up, it binds with the grass. The machine does not get warm to the touch so that it won’t harm the faux lawn. Instead of the machine getting hot, it makes a radio wave energy field that goes down through the grass. The waves heat the tape, while the grass, the machine, and your hands stay safe and cool. Once you place your machine over the seam, you push a button to start the process. A green light on goes on to tell you that the radio field is doing its job. In seconds, the tape cools to create a smooth, clean seam. When the heat cycle is done, the light goes out. Then, you know the grass join is done, and it is time to lift the machine and move it ahead to bind the next part of the turf. It’s that easy to make a strong, smooth bind. This seam is almost instant, and since there’s no mess from glue, you won’t need to do a big cleanup job after you are done. Since the join takes place under the grass, the blades stay full and tall, and you cannot see the seam. You just see a nice, smooth lawn.You’ll be able to walk away satisfied knowing that you have made a clean bind that’s smooth and invisible. If you know have ever done turf seams with glue in the past, you will see how this new Easy Seam system has changed the game. You used to need a big labor force to lay and bind fake grass. It took more than one person to hold, shift, fix and glue the lawn in place. Then once the grass was laid, it was time for the whole team to wait for the glue to dry. Once the glue was fully set, cleanup with mineral spirits got everyone back to work so they could leave the lawn smooth and clear at last. Now with Easy Seam, you can bind a whole yard on your own, with no wait time and no mess. It saves time, and it cuts labor costs with its ease of use for a quick, clean turf installation. One of the ways it makes solo lawn install possible is by letting you make fixes as you go. If turf buckled or bent and the join was not smooth or clean, with glue you might not see the problem until the full seam was laid out. Then you would have to stop and get mineral spirits, so you could use it to clear away the glue all along the bind. 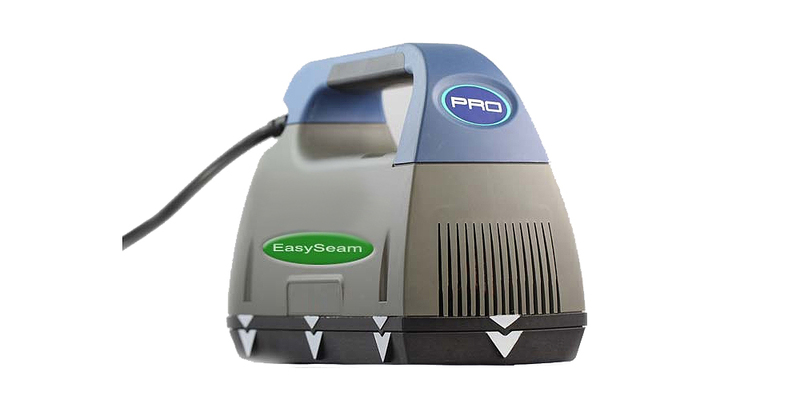 That would all need to take place before you could even start to repair the problem spot with a clean, flat bind that looks the way you want.When you use the Easy Seam machine, you bind only a small section of lawn at a time. So, you can see right away if there’s a problem. Then, all you need to do is go back to that area and de-activate the tape using the Easy Seam machine. The lawn pops right off the tape strip, and you just place it again for a fast fix. There’s no glue residue left behind, and no damage to the faux grass if you make a mistake. Thanks to the fact that you can work solo and make quick fixes as you go, Easy Seam is a big shift in how artificial grass is installed. Be part of this trend, and get ahead of your competition. Contact Watersavers, and try this new technology on your next synthetic grass project. Our stock covers all your turf accessory and fake grass needs. Along with the Easy Seam machine and tape, we have a full range of all the tools and products you need to install turf right. We carry 60+ types of lawn replacement products with a match for every yard. Get a free Watersavers estimate for faux grass, visit a store, or call us at 844-974-8873.